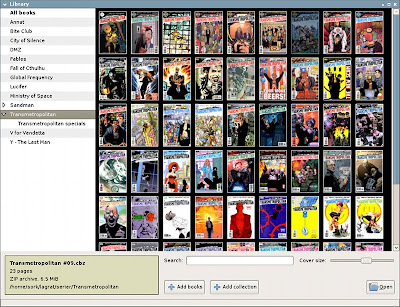 For comic book addicts, here's a Linux application that you should get. 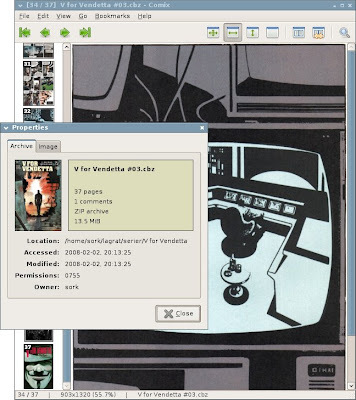 Its name is Comix, and it’s an easy-to-use and intuitive image viewer that is specially designed to view digital comic books. Comix can read images as plain image files and can even handle archived files like ZIP, RAR, gzip and bzip2. Its user-friendly interface has a handy sidebar thumbnail viewer and library viewer. It has left-to-right and right-to-left reading modes, and caches upcoming pages for faster flipping. * Fit image to window width, height or both. * Reads most common image formats. * Available in over 20 different languages. Comix is written in Python and uses GTK+ through the PyGTK bindings. If you are using popular Linux distributions like Ubuntu, Fedora, SUSE, and PCLinuxOS, you can get Comix via their respective package managers. Else, you can get it HERE.